The second round of fixtures at the FIFA World Cup came to an end last night. We now have 5 teams eliminated and four teams already qualified for the second stage. A tournament that has produced 94 goals in 32 games has given the fans the sublime, the ridiculous and the absolute beauty of the game. Lets have a look at our key picks from the second round of fixtures. There were some outstanding goals once again and obviously one momentous goal (Klose FIFA World Cup no 15.) Andre Ayew’s powerful header, Lionel Messi’s last-minute thunderbolt and Luis Suarez brilliant glanced header were all good goals, but few can argue with the perfection of Tim Cahill’s left foot volley. The right footed attacker is more renown for his aerial ability, but Cahill pulled Australia level in a great game with a strike more akin to Robin van Persie. It was probably Tim Cahill’s last ever FIFA World Cup game and he went out with a sensational statement! Again here we have seen Messi, Benzema and Enner Valencia put their hand up for this role with some super performances, but it is the opening game of the round that produced the stand out performance. 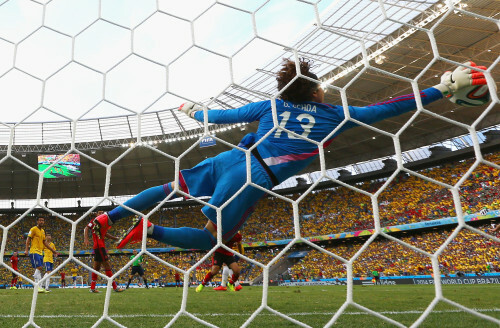 Guillermo Ochoa produced a display in goal-keeping that set the bench mark for keepers at the 2014 FIFA World Cup. His six saves included 2 match saving saves from Neymar and Jo. He owned his box incredibly and made reflex saves that ultimately saw Mexico emerge with a point and joining Nigeria as the only teams with two clean sheets. 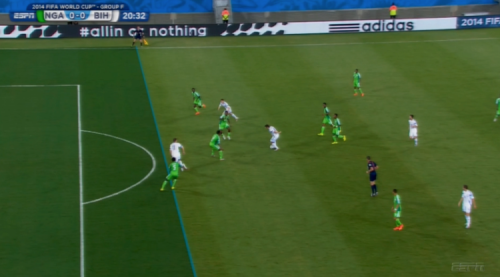 Nigeria may have kept two clean sheets so far, but they really should not have. Eneyeama was beaten by Manchester City striker Edin Dzeko who was called for offside. At this time it would have been 1-0 to Bosnia. At the end of the day the Nigerians won 1-0 and the Bosnians were eliminated from the FIFA World Cup. Dzeko was fuming afterwards and righfully so, it was a big decision that had big implications and another time when the linesmen have not supported the ref. Cameroon are arguably the embarrassment of World Football. They would not go to the FIFA World Cup until their bonuses had been paid, they refused to meet the president before departure and have played in spineless fashion. Benoit-Ekoto head buts his own team-mate, but its Alex Song’s moment of absolute petulance that gives him this award. On a break, Mario Mandzukic runs across the Barcelona midfielder and the nephew of the great Rigobert Song replies with a swiftly delivered elbow down the back of the Croatian. A moment of red mist saw the Cameroonian receive an appropriately coloured card. We saw some great African results with Algeria and Nigeria getting victories. Costa Rica booked their place in the last 16 and Belgium won again, but it is France who attracted the most plaudits this round. The French, spear-headed by Karim Benzema and without Samir Nasri, produced a breath-taking display of counter attacking football and scored 5 goals through 5 different players. This is a very different French team from 2010 and they are thoroughly enjoyable to watch. They probably wont go the whole way, but France know how to play in big tournaments and they are doing with a bit of swag at this World Cup. Ah you beauties. 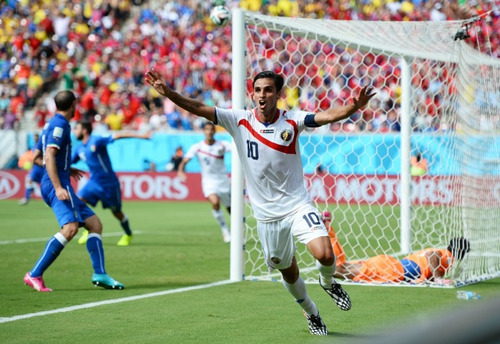 Costa Rica played their second top 10 opponent and won their second game. It could have been worse for Italy as Chiellini somehow was allowed to mow down Campbell in the box with no attempt of playing the ball. The American nation have captured the heart at the World Cup and have emerged from a group they were favoured to prop up. Chile’s victory over Spain and Ghana’s draw against Germany were my other two front-runners for this award. We were blessed in round 2 of the FIFA World Cup as we saw some humdingers. We saw a riveting 2-2 draw between Ghana and Germany, a ruthless 5-2 spanking by France over Switzerland and the emergence of Africa as a force with the 4-2 win by Algeria over South Korea. But my favourite match of the round was the back and forth match between Australia and Netherlands. Holland led through a sublime Robben goal only for Tim Cahill to score the goal of the tournament so far. Into the second half and a dubious call saw Jedinak put the Aussies into the lead, but then Robin van Persie levelled. Australia then should have scored but a poor cross meant the finish was too difficult and just seconds later Memphis put in a long-range finisher to win the game and seal progress to the last 16. What a game.